SAMR is a model designed to help educators infuse technology into teaching and learning. Popularized by Dr. Ruben Puentedura, the model supports and enables teachers to design, develop, and infuse digital learning experiences that utilize technology. The goal is to transform learning experiences so they result in higher levels of achievement for students. I feel teachers need to both create tasks that target the higher-order cognitive skills (Bloom's) as well as design tasks that have a significant impact on student outcomes (SAMR). My thoughts about the the model are further down this page. He graciously Creative Commons-licenses them to allow for reproduction on other sites with attribution. I have taken one of the PDF files and turned it into a slideshow below. I have included links to the original PDF files in case you want to download it from Dr. Puentedura's site. I feel teachers need to both create tasks that target the higher-order cognitive skills (Bloom's) as well as design tasks that have a significant impact on student outcomes (SAMR). A visual to illustrate that follows. Educators will argue they have seen redefinition tasks that only target the remembering level or have a creative assessment that is only at the augmentation level. Of course that is true, but I believe we should be planning for technology tasks, activities, and assessments that include both the higher levels of Bloom's Revised Taxonomy and the transformation area of the SAMR model. Dr. Puentedura's take on SAMR and Bloom's can be found here. Mine is below. Download a PDF version of the image above for personal or classroom use. Re-publishing on the Web or in an print article is NOT permissible since this is still in beta. Thanks! 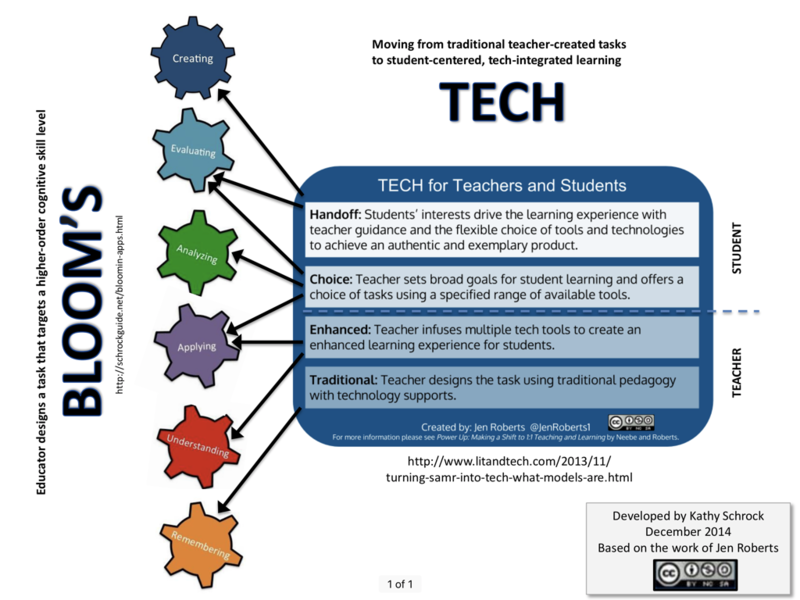 Jen Roberts (@jenroberts1) has developed a great model that concentrates more on moving from traditional teacher-created tasks to student-centered, tech-integrated learning. She calls it TECH. Her blog post about her development of it may be found here. HaikuDeck made from a blog post here. An illustration developed by Jonathan Brubaker and appearing in his blog post here. Republishing of these lists of links or author's orginal content without express and written permission from this site's author is not allowed.